PSA will get the Peugeot iOn from Mitsubishi. The car will be based on Mitsubishi's i-MiEV. PSA/Peugeot-Citroen SA and Mitsubishi Motors Corp. said on Wednesday they have agreed to work together to develop electric vehicle powertrains, initially focusing on light commercial vehicles. 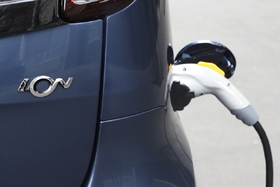 "This new step results from continuing discussions between the companies to expand their existing collaboration on electric vehicles," the two automakers said in a joint statement. Mitsubishi Motors said the deal was aimed at developing a commercial vehicle to be sold by PSA. In an interview earlier this month, PSA electric vehicles director Ayoul Grouvel told Automotive News Europe that PSA was looking to develop an electric car-derived van that could resemble the Citroen Berlingo or Peugeot Partner. “We see goods delivery as the biggest potential in the first phase of the electrification of urban mobility,” Grouvel told ANE. Fleet-operated delivery vans normally are driven the same distances – and often the same routes – when in service, making them a strong candidate for electrification because planning when and where to recharge them is easier than it is with private customers, whose travel distances and routes differ greatly, Grouvel said. The Japanese and French partners last September signed a contract under which Mitsubishi will supply electric cars to the Peugeot and Citroen brands. The cars will be based on the i-MiEV minicar that is on sale in Japan and arrives in Europe later this year. PSA's will launch the i-MiEV-based Peugeot iOn and Citroen C-Zero electric cars in Europe later this year. In the past few weeks, the two companies have also started discussions on possibly sharing Mitsubish's low-cost Global Small Car to compete in emerging markets, a Mitsubishi Motors spokesman said.